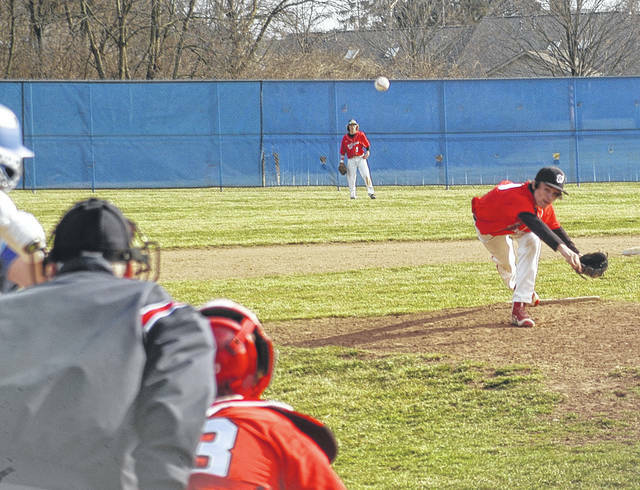 Wayne starting pitcher Caleb Mervar delivers a pitch to the plate against Xenia. Mervar pitched 5 innings, gave up five hits with five earned runs, struck out six, walked three, hit one batter with an errant pitch and threw two wild pitches. First base coach Wayne Schroeder discusses base running strategy with Julian Stines. Jordan Long hits a hard smash between first and second that resulted in an error. Long would later score to start Wayne’s seven run rally. Michael Barnes slides in safe at second vs. Xenia. 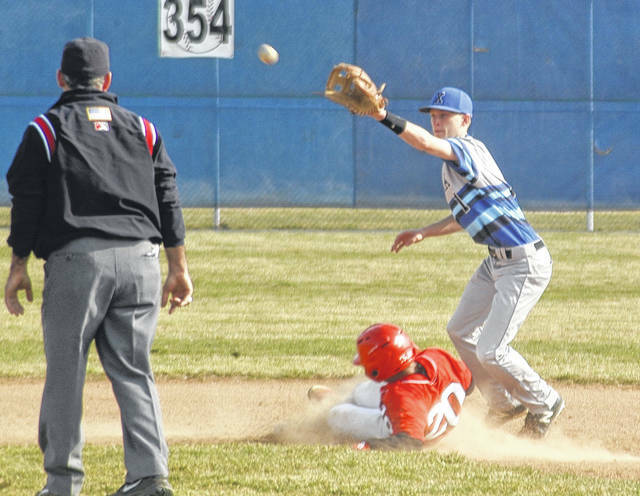 XENIA — After dominating most its game Thursday at home vs. Wayne the Xenia varsity baseball team suffered a total meltdown in the top of the 7th inning that allowed the Warriors to take a three run lead. The Buccaneers rallied to score three runs in the bottom of the 7th but play was suspended I the top of the 8th due to darkness. The game will be completed at a later date when both teams find an open date. Both coaches agreed to play a second game after the suspended game is decided even though the schools are not scheduled to face each other twice during the regular season. With the game tied 2-2 Xenia got three runs in the bottom of the 4th inning to take a 5-2 lead. Xenia pitcher Alex Sparks led off the home half of the 4th with a single to left. Dylan Hall laid down a sacrifice bunt to advance Sparks to second. Sparks stole third and Blayne Dudley drew a walk and stole second. Aaron Adkins laid down a sacrifice bunt on a suicide squeeze play that enabled Sparks to score and Dudley turned on the afterburners to score as well with some heads up base running. Aydan Evans stroked a two-out single to right and advanced to third when Joey Lewis legged out an infield hit. Evans scored on a wild pitch before the inning ended to give the Buccaneers a 5-2 lead. That lead increased to 6-2 in the bottom of the 6th inning. Dylan Hall reached on an infield error and advanced all the way to third on a sacrifice bunt by Dudley. Adkins followed with a sacrifice fly to centerfield. After that the wheels fell off for Xenia as Wayne mounted a huge rally to take a three run lead. In the top of the 7th Jordan Long hit a hard smash between first and second. Xenia’s first baseman dove for the ball even though it could have been easily fielded by the second baseman. The ball deflected off his glove and into shallow right field to put Long aboard. Matt Sexton ripped a single to left field with Mason Wonderly coming in to pinch run. With one out Connor Fiegly reached on an error to load the bases. Sophomore Julian Stiner stroked a two-out single to score Long and Wonderly with Fiegly advancing to third. Freshman Ben Bochenek legged out an infield single to load the bases again and Nathan Klarer came in to pinch run for Stiner who was now on second base. Sophomore Michael Barnes reached first on an error with Fiegly scoring while Klarer advanced to third and Barnes to second. 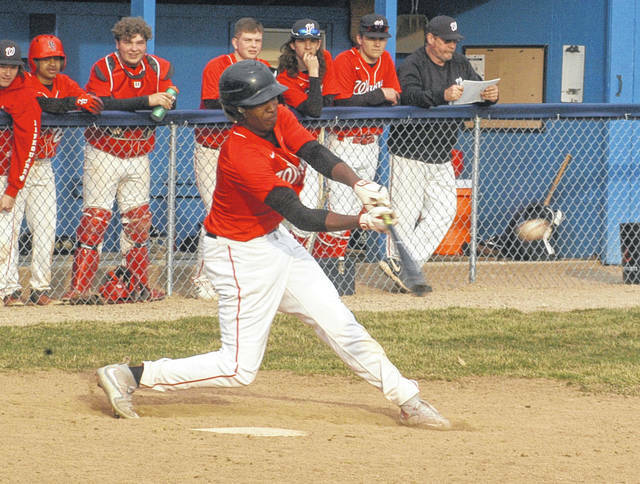 Klarer scored on a wild pitch and junior Garrett Valentine drew a walk to reload the bases. Long followed with another walk to score Barnes. 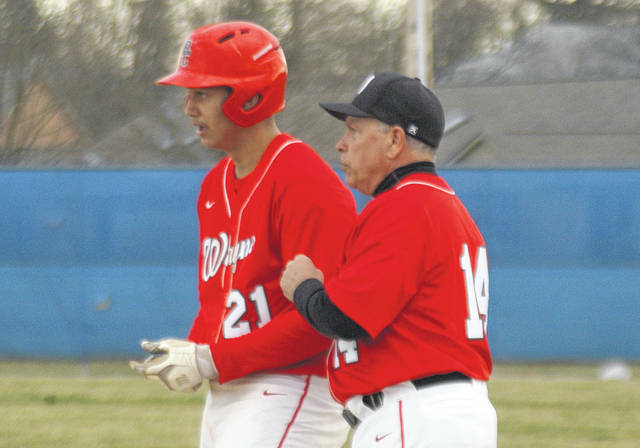 When Wayne coach Joe Yount tried to pinch hit Sexton for the second time in the inning for Wonderly, that brought Xenia coach Barry Claus out of the dugout to dispute the move. The umpires ruled that Wonderly would have to take the at-bat. That dispute backfired when Wonderly belted a two-out double to left to drive in two runs. Xenia lifted Sparks from the mound with Ben Hatfield coming on in relief. He ended Wayne’s rally by getting a fly ball to left. Wayne looked like it had the game in the bag with a 9-6 lead. Not so. With Fiegly coming in to pitch for Wayne he retired Xenia’s first two hitters on fly outs to center and right field. Junior Andrew Pollander hit a hard grounder to deep third base and legged out an infield hit and stole second. Sparks drew a walk and Dylan Hall belted the ball down the first base line that deflected off the Wayne first baseman’s glove and into right field to score Pollander and Sparks. That play resulted in Fiegly getting the hook with Garrett Valentine coming on in relief. Hall stole second base and Dudley reached first on an infield hit to advance Hall to third. Adkins drew a walk to load the bases and Valentine couldn’t find the strike zone with Aydan Evans at the plate. Evans drew a bases loaded walk to score Hall to tie game 9-9. Valentine got Joey Lewis out on a fly to centerfield. In the top of the eighth inning Fiegly drew walk on a full count and advanced to second on a wild pitch. At that point play was suspended with heavy clouds rolling dimming the field and creating less than ideal playing conditions. Wayne has an open date to finish the suspended game and play a second one against Xenia. The Buccaneers currently do not have an open date but when one becomes available the two teams will meet to determine the winner. Yount was pleased to see his team hit the ball well under pressure when the Warriors were trailing by four runs in the 7th inning.